The Lower Neck and Shoulders (primarily the Trapezius muscle, connecting your neck to your shoulders. Each position should ideally be held for 30 seconds at the beginning (though shorter if you fatigue). It should be noted that your blood pressure can rise dramatically when performing these techniques so if you suffer form hyper tension or a heart condition check with your doctor first. If you have any questions regarding these techniques and how to get the most out of them, I highly recommend that you pick up a copy of 7 Seconds to A Perfect Body - with over 250 pages of awesome instruction, over 100 HD photos it has my complete back training program and training for every other muscle group to get YOU the body of your dreams. Breathing during isometrics is also very important. You should NEVER hold your breath during Back Exercise Isometrics or any other body part for that matter. The best way to breath is by taking a deep breath prior to an exercise and while tensing the stomach slowly “hissing” it out like a flat tyre or a snake. This will cause extra tension and power allowing you to push harder and really get the best results. This is one of the best exercises in the world bar none. It can quite advanced for some but is worth mastering. This works every aspect of the back and is the key to Back Exercise Isometrics. Place your feet as close as you can get to your bum and hip distance apart. Put you hands palm down on the ground behind your head. As you do so concentrate on making your back as tight and hard as possible. After a few seconds you should feel you’re back, arms and glutes shaking all over – this is the muscles tiring as they work really hard – this is Isometrics. Slowly release – this is important, after intense contraction your body needs time to unwind. Sit down on the floor with your legs straight out in front of you. (you should look like an L on its side). Holding the towel with one end in each hand place around your feet. Pull the rope back – try ot get your elbows to touch behind you. 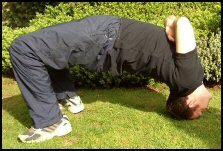 As you do so concentrate on making your back and the space between your shoulders as tight and hard as possible. Stand up tall and straight. If you’ve followed the above Back Exercise Isometrics routine it should have taken no longer than 2 minutes and you have just done a complete back workout! Your back should feel warm (maybe slightly stiff if this is your first time), relaxed and powerful. Try it again after a days rest. Now here's a bonus - a video covering several more Isometrics for the back! Now...here's what I want you do next. Practice the above Isometric contraction every day for a week. Come back here and post how you feel after a week below. I'll be looking for your comments and will keep you on track. Subscribe to the newsletter - there's a few free e-books, isometric guides and even a few instructional videos for the abs. I'll also be able to keep you up to date with the next article in this series. Finally, if you're looking for a more comprehensive program or more isometric exercise help check out my Perfect Body system. Should you have any questions, comments or suggestions please do not hesitate to contact me.